Philadelphia PA (May 2017) - Chill Moody cemented his status as one of the top lyricists and performers to hit Philadelphia in years when he won "Best Rapper" in Philadelphia Magazine's annual Best of Philly issue in 2014. Moody's brand, nicethings, continues to push the limits with music, apparel, and now, beer. This week, Moody is officially launching nicethingsIPA, a partnership with Philadelphia's Dock Street Brewery. When the 2016 soft launch of nicethingsIPA sold out in just a few weeks, it was clear Moody had another hit on his hands. On Friday, June 2, 2017, as part of Philly Beer Week, Chill Moody will perform "unplugged" at Heritage (914 North 2nd St.). He'll explain how he came up with his hit songs such as "Inhale, Exhale", "3 Wishes", "Never Fail" which he recently recorded for the NFL Draft, and new song "Hey Mama" that was launched on Mother's Day. 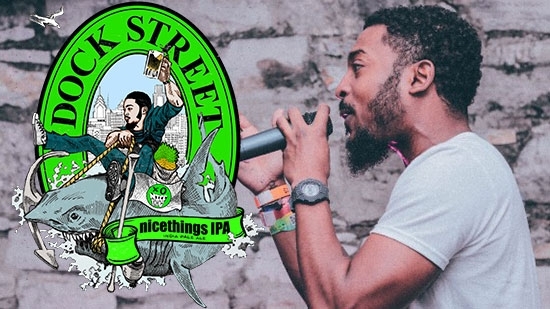 The event will feature nicethingsIPA along with a great lineup of beers on draft from Dock Street Brewery. The special Philly Beer Week event, which is from 10pm to 2am, is free and open to public. Also on Friday, Moody released 'PackUp' produced by Frank Knuckles of the Grammy Award winning hip-hop group, The Roots; adding to his long list of collaborations with the group. The song is now available on iTunes, Spotify, Google Play, Amazon, Tidal, and on Pandora. Moody has already had a "nice year" with the release of new album It's Gon' Be A nice Year and performing at the NFL Draft held in his hometown of Philadelphia. Moody describes his new album as a "table of contents to Chill Moody." It's a road map of his personal journey, as well as a sincere look into his artistic process. To learn more about Chill Moody follow him on Facebook, Instagram, Twitter, Youtube, and be sure to visit http://chillmoody.com. Known for his dynamic live performances, Moody has performed on all the areas' best stages, including Wawa Welcome America, the Roots Picnic, the Kimmel Center, The Fillmore, & he has had multiple sold-out shows at the TLA, The Trocadero and Hard Rock Café. Moody is Philadelphia's official Music Ambassador because of his local & national accomplishments over the years: radio play, music videos on MTV Jams, 2 albums that debuted on the iTunes Top 100 hip-hop charts, & performances at A3C Hip-Hop Conference (2013; 2015), in LA during Grammy Week (2014; 2015) and South by Southwest (2014; 2015; 2016; 2017).